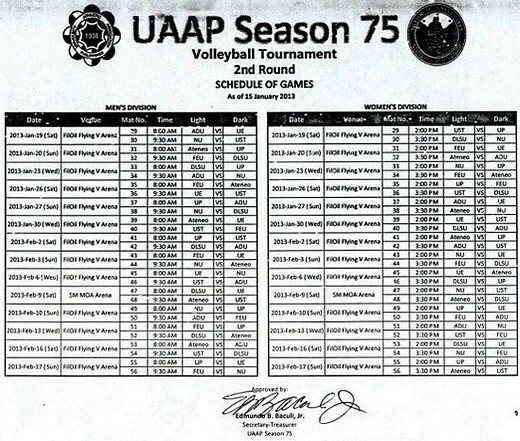 This is the full schedule of the UAAP Season 75 Women’s Volleyball 2nd Round which will start of Saturday. The venue of the games will still be at the FilOil Flying V Arena in San Juan except for the Ateneo Lady Eagles vs. DLSU Lady Spikers 2nd Round Match on February 9, 2013. That match will be held at the SM Mall of Asia Arena in Pasay. Congratulations Ateneo Lady Eagles !!!!!! To GOD be the Glory !!!! !